It was a couple of years ago when I only had one child, and didn’t really have anywhere I HAD to be during the day. I was kind of a good mom then. Gavin, who was about two, and I would go and do really productive and educational things during the day, like visiting the zoo or the library, or Target. Let’s rewind a little bit. When Gavin was about 18 months old he had a language explosion! What he lacked in physical ability (buddy, they are just stairs, they aren’t Mt. Everest), he made up for in language ability. And it was around the age two that Gavin perfected the phrase, “Sorry, Mama! I can’t help it!” An important piece of arsenal in the weaponry of any cute two year old. Especially when they can pair it with puppy dog eyes. Anyway. That pretty much brings you up to speed. So it was about the time Gavin was two or two and half. We were in the bathroom at the children’s museum. It is a great place that attracts people from all demographics, but I have to say that most of the times I’ve been there it is over populated with upper class moms who look peeeerfect. And my disheveled self sticks out like a sore thumb because I just can’t bring myself to get dolled up to go to a children’s museum. Can’t. Won’t. Shan’t. Anyway, after more coffee than is really reasonable for one person, I had . . . to use the restroom. I’m in there, and fearing that my loud mouthed kid will be kidnapped from the bathroom, because in addition to being verbal, he’s super comfortable with strangers, I bring him into the stall with me. He’s just standing there like a good little kid, and he’s being quiet about all bathroom activities, which is great, because I can hear two of the perfect moms by the sinks. Touching up their make up maybe? I don’t know. Then it happens. I get up, and before I can flush, Gavin runs over, like this is a spectator sport or something, and says louder than a two year old should really be able to muster, “Wow! Good job poopn’, Mama!” with more pride in his voice than a grandma talking about her new grand baby. 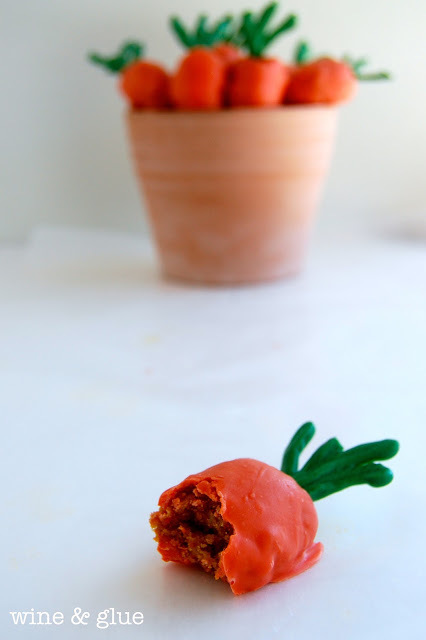 But rather than focus on that, let’s focus on these Baby Carrot Truffles. They are made with America’s Test Kitchen’s carrot cake recipe, which is moist and divine. And when paired with the sweet vanilla of the orange and green candy coating, it’s perfection. 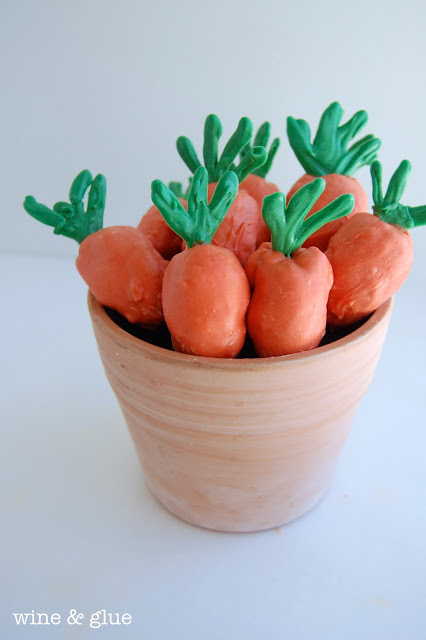 I’m going to go into more details below, but basically you want to make your cake truffle carrot shape, use a fork to dunk it in orange candy coating, and carefully stick in the green topper that you made earlier (see photo above) while the orange chocolate is still wet. If you leave a finger print at the end of the carrot, just drip some more orange chocolate on there to smooth it out. Preheat your oven to 350 degrees. Whisk together in a large bowl the flour, baking powder, baking soda, and spices. Slowly add the flour mixture. Stir in the carrots. Pour into a 9 by 13 pan that is greased and floured. Bake 35 to 40 minutes until you can stick in a toothpick and pull it out with just a few crumbs on it. Let the cake cool over night or for several hours in a refrigerator. Make your carrot tops by melting green candy melts in a bowl in the microwave and then putting the melted chocolate in a zip lock bag. Zip it shut and cut a very small hole in one of the corners. 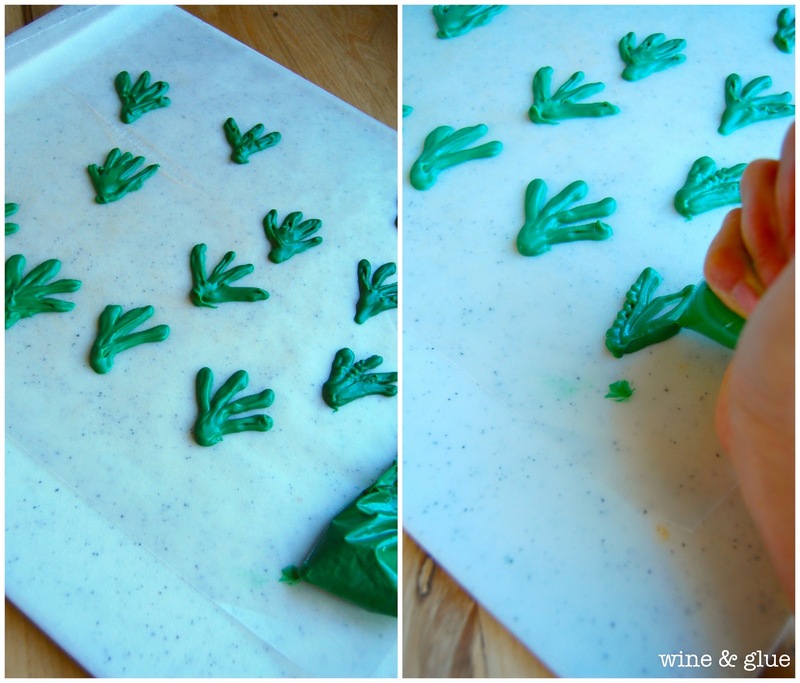 Squeeze out the green in a carrot top pattern on wax paper. (See photo above.) Allow to dry. Break the caked up in a large bowl with a fork or the back of a spoon. Mix in the frosting a spoonful at a time. You want it to stick together well, but not be so frosting filled that it tastes more like frosting than cake. And this is a moist cake, so you will probably use less than with your typical cake pops (between half and 3/4 of a standard can of frosting). 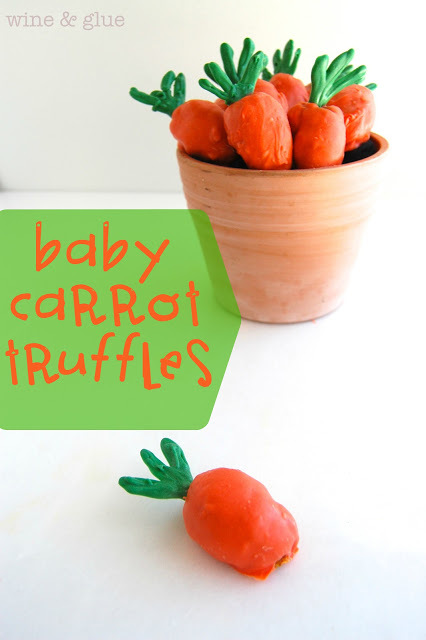 Shape your truffles into cone like carrot shapes. Dip it into the melted orange candy melts with a fork and carefully place it on wax paper. Gently push the stem into place. If you get a finger print on the carrot, use a spoon to add more orange and smooth it out. You may need to place something under the stem so it stays (like an overturned spoon) until the orange dries. LOVE these truffles. Too cute for words! Ahhhhhh!!!! No!! That is so much worse!! Cutest thing ever! I was just following the TT&J rules, by going to link that stood out to me. Your have been the 2 think I clicked on!!! Wow, you definitely know what you’re doing! I’m a new follower. Lisa, these are super cute! I don’t have kids and there are plenty of times when I don’t even bother getting cute unless if I totally have to! The girls who wear make up at the gym are the ones that really annoy me! Darling idea! – Also “Hold your horses” story. ADORABLE!! These are just the cutest. Oh my gosh, Lisa, hysterical! Kids say the darndest things, don’t they? Haha. Cutest truffles EVER, by the way!